The forthcoming release from the "SR" label is titled "Moving Forward" and will feature the unreleased show from Las Vegas February 22, 1970 DS. As everybody knows SR concentrates it's work on early 70's live period of Elvis' activity, trying to produce always unreleased shows with Elvis at the top of his possibilities. 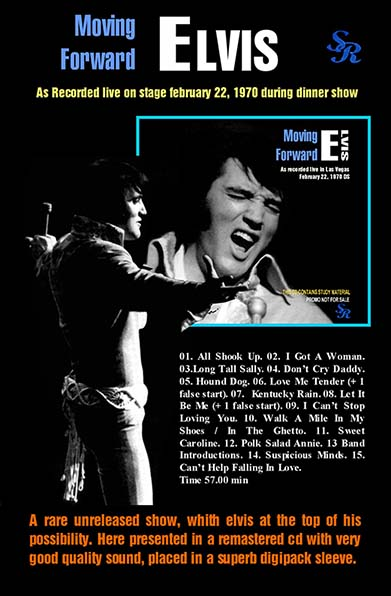 With the new release, we are proud to present the complete show from February 22th dinner show,a rare show from a Vegas winter season always poor of official and unofficial releases.. Elvis' love of singing is clear in this tape and we are glad to give you the opportunity to listen to it. The Vegas second season allows Elvis, after paying his debt to the golden past in the ’69 season, to demonstrate his true abilities. We see the best of Elvis in songs that will become the fulcrum of the Elvis show until 1972.The midnight show from February 22th, represents very well the shows of the season, the absence of mostly of the classic repertoire from the golden era, as newspaper noted make to think that Elvis is moving toward a more contemporary repertoire… …The combination of all his latest four singles with the new songs although covers, give to listener something unique that unfortunately will be no repeated in the future.. at least with this intensity.. yes we are talking about covers but Elvis still has the ability to take a song and turn it in HIS song…Polk Salad Annie or See See Rider are the perfect example. Talking about the show , the show is solid and rough no too long the classic 60 minutes of pure energy , Elvis worked hard performing 14 songs, including his new single “Kentucky Rain.” together the best repertoire of the season. Talking about best songs is always hard overall in this kind of show where all the songs are very well performed, however surely we appreciated the incredible Walk a Mile in My Shoes/In the Ghetto medley. This recording come from an early generation copy of the master tape, the sound quality is good considering the early season. The sound was restored in a studio to achieve best possible results. We have spent hours in the studio over the digital restoration of the sound, to achieve the best possible results and to give you the chance to hear it with pleasure. This new CD will come with the classic of deluxe Digipack four panels, containing a collection of live photographs from the Season + newspaper clip . 01. All Shook Up. 02. I Got A Woman. 03.Long Tall Sally. 04. Don’t Cry Daddy. 05. Hound Dog. 06. Love Me Tender (+ 1 false start). 07. Kentucky Rain. 08. Let It Be Me (+ 1 false start). 09. I Can’t Stop Loving You. 10. Walk A Mile In My Shoes / In The Ghetto. 11. Sweet Caroline. 12. Polk Salad Annie. 13 Band Introductions. 14. Suspicious Minds. 15. Can’t Help Falling In Love. Exactly the same running time as the cdr floating around in collectors circles...and the sound is not good there,,..pity....the show is excellent..